The project has been very busy during the past two months. We are very happy to announce that we have the first three cacao clones planted in the village! Please enjoy the pictures of the work done with the help of our volunteers, donors, other organizations, and the people of the village. 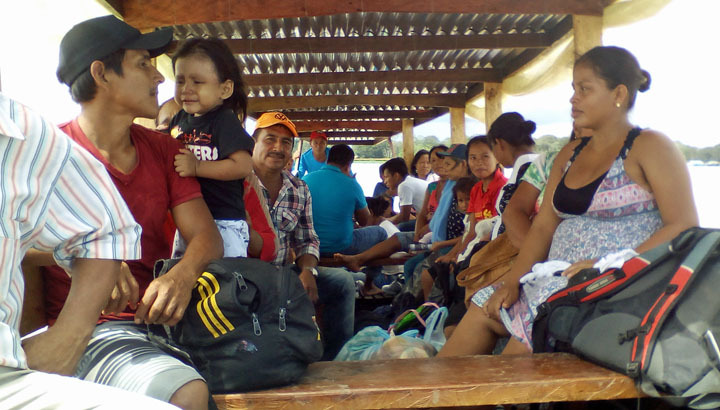 During the early part of this year we had many problems with finding safe, adequate transportation. This is also a problem faced by many in the community. 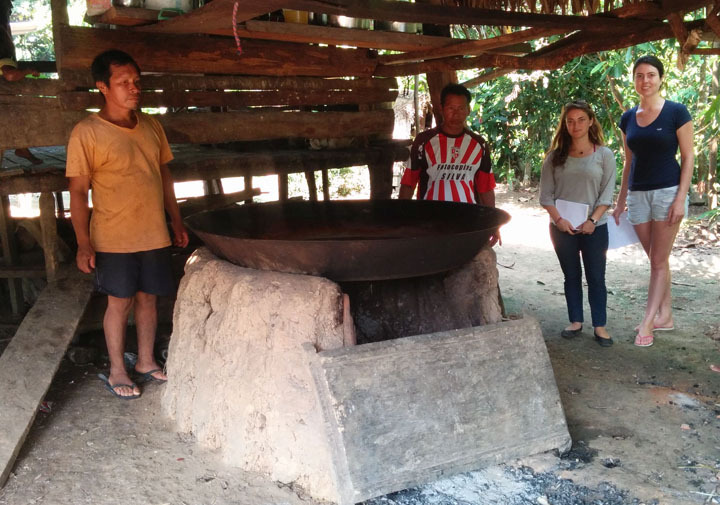 It is difficult to bring agricultural products to the market in Leticia. 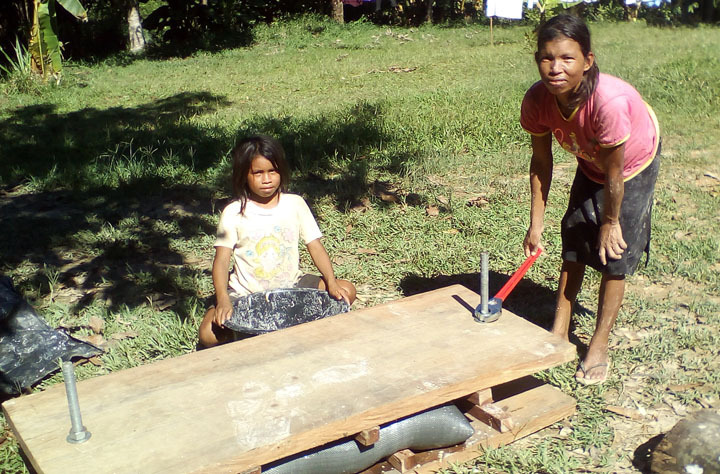 It is also difficult to bring food items and building materials to the village from Leticia. 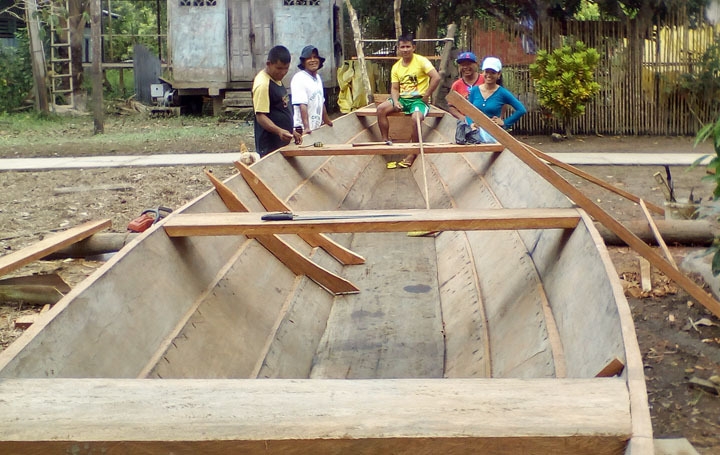 Our new boat helps the community to more easily secure this needed transportation. The boat was built-to-order in the Peruvian village of Puerta Algeria. It is 12 meters (39 feet) long. It is built mostly from cedar wood. It can carry two metric tons of cargo safely. It is powered by a 15 horse power Yamaha outboard motor (not pictured). The roof is made from zinc laminate. It provides a measure of protection from the sun and rain of the Amazon, which can be very intense. We hope to add minimal-weight siding in the future. Our first trip in the boat was to take the eight students, who are being sponsored by the project’s supporters, to do their second school shopping trip. 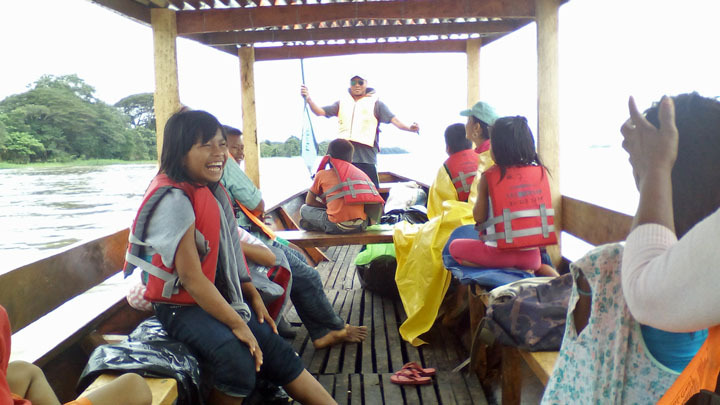 Our second trip in the boat was a trip to Leticia for the villagers attend appointments and to go to market. On the trip back upriver we picked up additional passengers. We charge 2 dollars one-way. The fare we charge pays for the gasoline and the maintenance of the boat. The system, with our fare charge, should be economically sustainable. Our current guest house is small and it’s wooded walls are rotting. 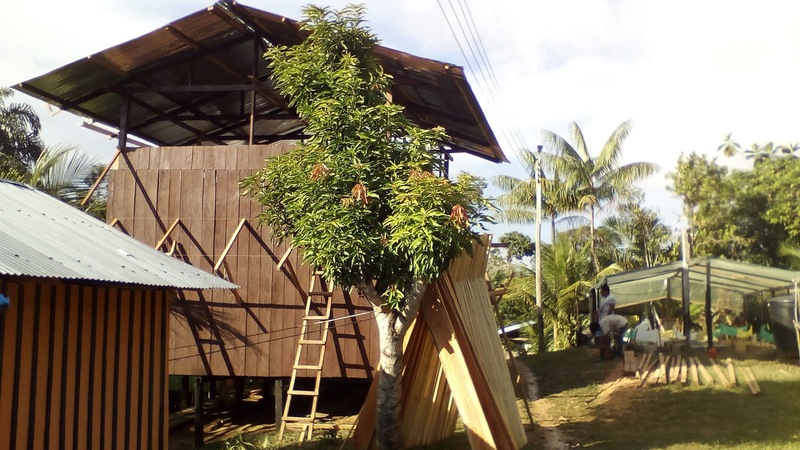 The new guest house will be slightly larger, 5 meter by 6 meters, and have two floors. The first floor will house up to four volunteers. The volunteers may be from the Amazon Pueblo project, but they may also be from other aid and support organizations. Anyone helping the village is welcomed to stay free of charge. The second floor will be a classroom. 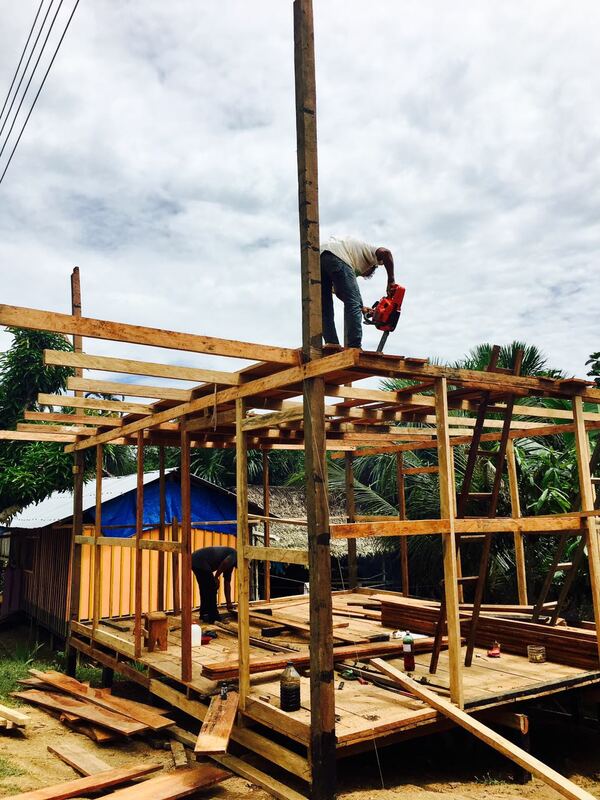 The classroom will be used to teach English, math, business skills, agricultural classes, and for meetings. Of the 47 houses in the community, only three have two floors. The house during the last week of construction. The community garden can be seen to the left of the house. 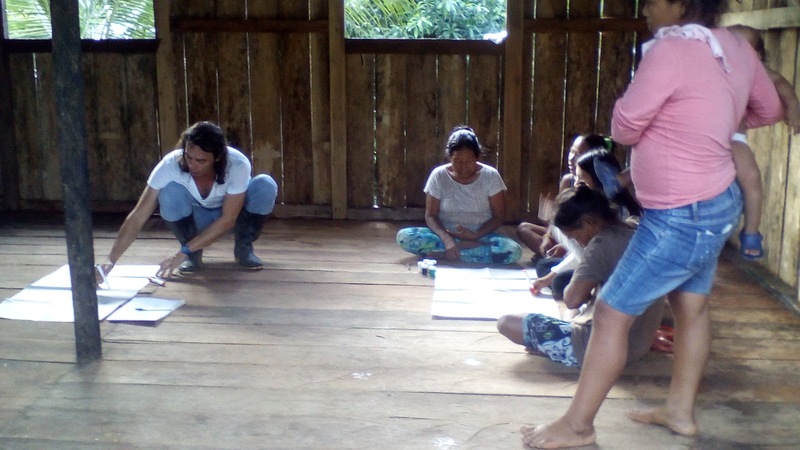 Even before the house is finished it is being used by Camilo (an instructor from El SENA) to teach an agriculture class. The villagers grow no vegetables except for a small variety of peppers. The community garden will provide them with another source of nutrition and, if they garden well, another source of income. The community garden was made possible from a grant by the Maine-based Flannel Shirt Fund. 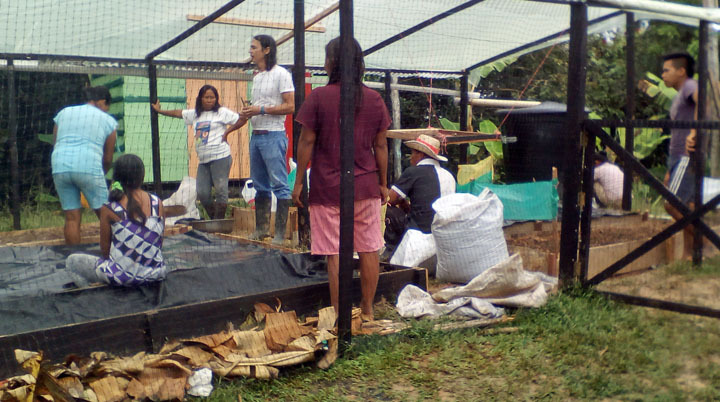 Camilo is giving the practical part of the agricultural class by using the community garden started by the project. Every day between 10 and 15 students attend the class. 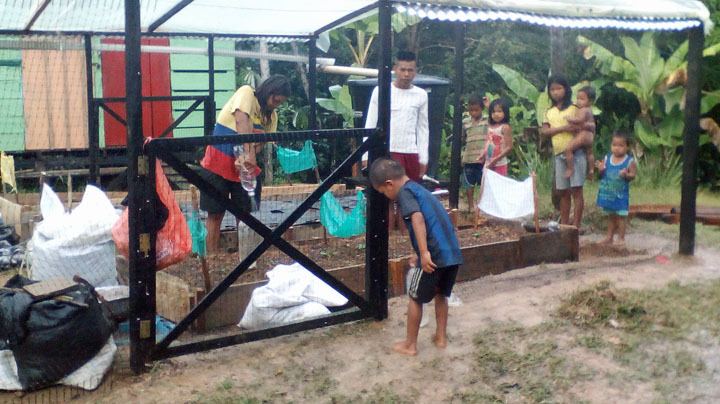 The village children also learn about and help to tend the garden. They were very excited to see the first sprouts from our cucumber seeds! Cacao is the plant from which chocolate is made. It is a good crop to grow in our region of the Amazon. It has the potential to provide much employment to the people of the village of La Libertad and the surrounding villages. 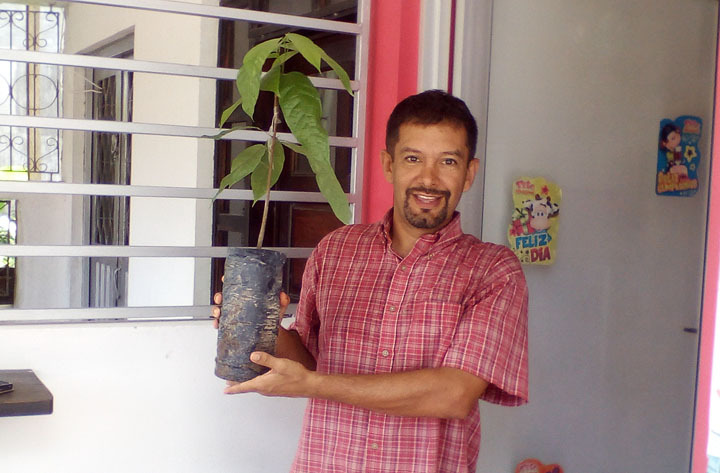 Ben is holding a cloned cacao sapling. It is of the variety CCN51 cacao. It is very resistant to illness. It is used to make commercial chocolate, like hot drinking chocolate or baking chocolate. This sapling is one of the first three clones to be planted in the village. The yuca processing plant makes farina from yuca. Over 75% of the villager families grow yuca, about half of these regularly make farina. Farina is a granola-like product made by grinding and toasting yuca. It has good nutritional qualities, a tasty flavor, and an excellent shelf-life. The process to make farina is very labor intensive. The processing plant reduces the time to make the farina by about half, with much less repetitive motion and hand-grating injuries. The farina may also be sold by the families to generate income. This is yuca, a starchy root. It has been harvested and pealed. It must be used within three days of harvest or it rots. Yuca takes about five months to grow. After pealing the yuca is grated and placed into large sacks. Before the grating machine was purchased all grating was done with small hand graters. 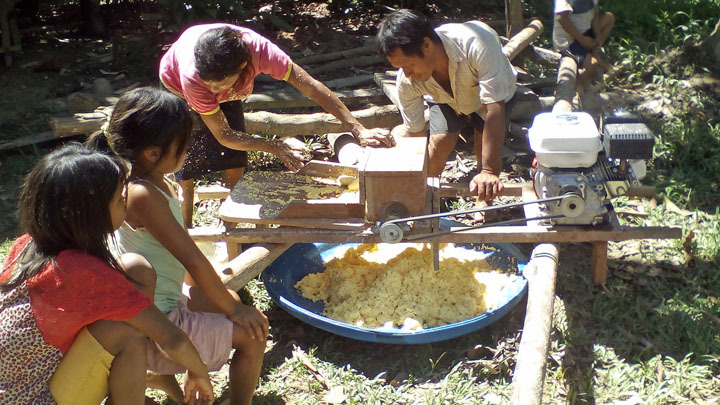 The sacks of grated yuca are then pressed between two large boards to remove much of the water. This press was designed by the project based on a plan from Africa (where farina is also produced). The yuca is then toasted for three three hours in a large pan. It must be constantly stirred to prevent burning. Pictured here is the old yuca toaster. It is made from mud. We have yet to build the new toaster. This is the finished product. 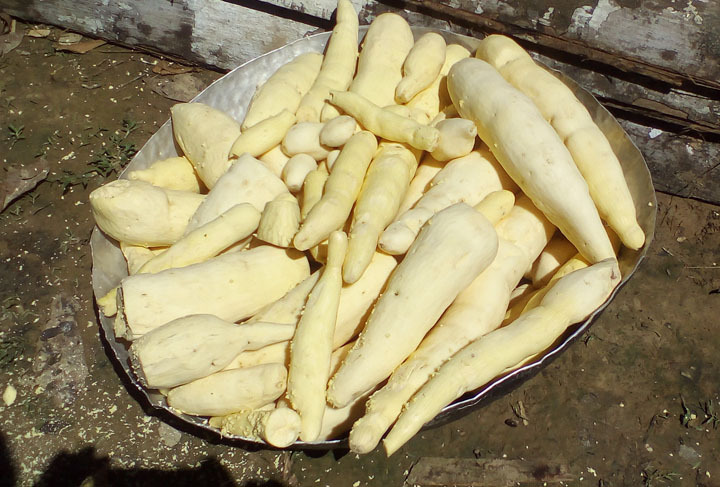 It is made from a yellow variety of yuca (yuca brava) which is different from the white variety which is commonly used for cooking. Gina is our most recent volunteer. She is from the northern coast of Colombia. She lived in the USA from 15 years and attend university in Florida. Gina spent three weeks volunteering with the project. 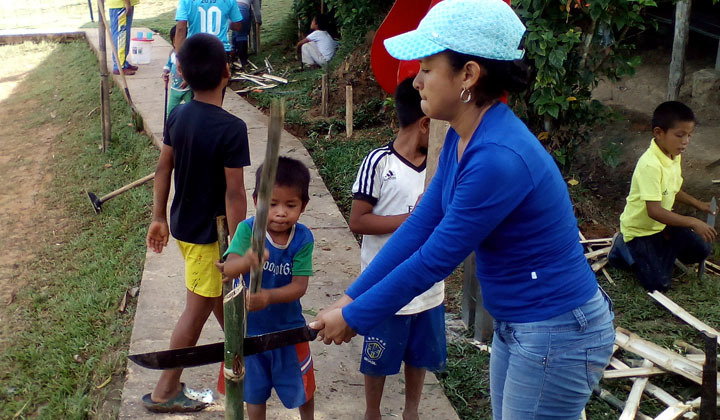 Gina is helping construct a flower garden that is being built by the teachers and students of the village school. 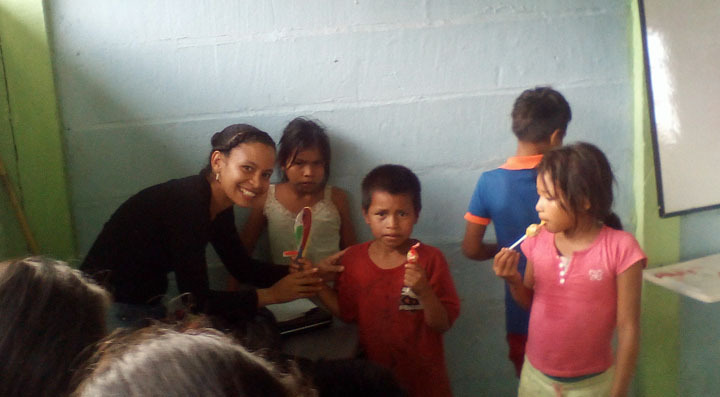 Gina also taught English, math, and dance to students and adults. Additional she helped with building projects and maintenance of our grounds. She was well-like by everyone. We hope to see her return soon. Thank you Gina!